Fever helps mobilise the immune system and impairs the function of viruses and bacteria. In most children – particularly those who are immunised – the fever is caused by a virus, but more serious bacterial infections need to be considered. How do doctors assess a fever ? How long should a fever last ? For most viral infections the fever peaks around day 2-3 then apart from the occasional spike the fever will abate. In some cases the fever can last for up to a week. 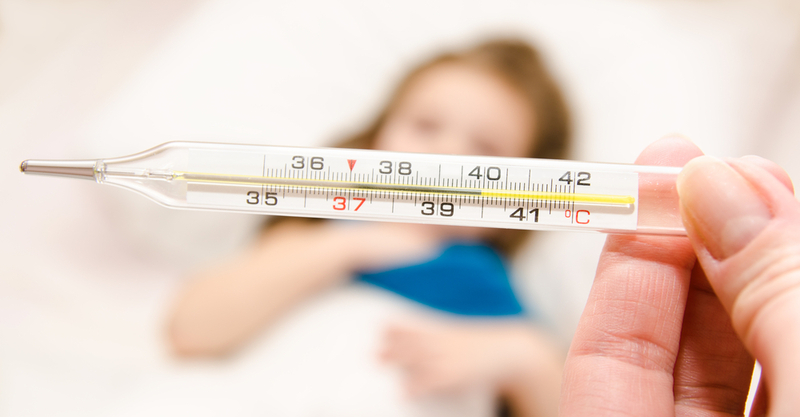 If you child has ongoing fevers, and there is no obvious cause, a review assessement is recommended if there is still fever after 5-6 days. Fever is measured by either a digital under the arm thermometer, or an infrared ear or forehead device. A fever is generally any temperature above 37.4 degrees celsius. Forehead adhesive plastic thermometers are not recommended. Infants between 3 – 12 months with a temperature can be reviewed by a GP depending on how unwell he or she is. If immunsations are up to date the most common causes are viruses, such as coughs, and colds. Tests will be unnecessary unless the infant appears unwell. However if there is no obvious cause for the fever, further investigations may be needed. The most common cause of fever that is not due to a virus is a urine infection, particularly in infant girls. If the infant is unwell then hospital assessment is mandatory. Between 12 – 36 months of age fully immuniseed toddlers with a fever will generally be due to viruses. However if after examination and history the cause of the fever is still unclear and the child appears unwell then further investigations are needed, such as urine and blood tests. Older children will have a more mature immune system and in most instances the cause of the fever is obvious and can be managed accordingly. If a fever lasts more than a few days it is worth being assessed, especially if the source is unclear. Give your child frequent small drinks of clear fluid (eg. water, diluted fruit juice or cordial). Do not worry if your child refuses to eat at this time. Paracetamol or nurofen can be given especially at night when the child fever can cause irritability and discomfort. A fever generally means 38 degrees or above. Viruses and bacteria do not like a higher temperature. Cool baths to ‘get the fever down’ are not recommended and are not necessary. Febrile convulsions occur in only 3% of the population. There is no evidence that controlling a fever with panadol, or sponging will prevent those that are susceptible from having a seizure. Many in the health profession will be unaware of this and will contribute to a parent’s concerns about fever by concentrating on trying to lower the temperature. There is no such thing as brain damage from a fever caused by an illness. Prior to the 19th century this was a common held theory and people died during febrile illnesses. In those days microbiology and science was only just starting to understand how infections worked. It was discovered the fever was a side effect of the infection not the cause of death or brain damage.